The first response from a few Muslims would be “no, no and no!” Muslims cannot celebrate resurrection of Jesus Christ. Jesus did not die, he and his message lives on! They would argue: To be a Muslim, one has to believe in Christ, the one who brings life to the dead, the one who has the healing powers, and one who is likened to the Morning star that brings the good news. He will come back as the Messiah to close the chapter of human suffering and bring salvation to mankind by reconnecting them with God. However, the insecure Christians and Muslims make a villain out of Jesus, “Yeah, he will come as Muhammad and slaughter every one and convert them to Islam.” On the other hand Muslims believe, “Yeah, he will come back and establish peace (Islam) on earth by forbidding evil and enjoining the good.” Shamefully those few on both sides are projecting Jesus in a political context. Jesus is indeed a unifier and will herd us all towards the elusive kingdom of heaven, where we will live an eternal life free from anxieties, fears and disappointments. The Muslim expression for such life comes from surrendering to the will of God. Whether Jesus was buried and resurrected, or taken up by God, faith in him is shared by more than half of the world inclusive of Muslims and Christians. Whether you believe in Jesus or not, his message of love thy enemy, love thy neighbor and forgive the other will set us free. Can we celebrate that message? To this Muslim, Easter represents resurrection of Jesus through his message, and Easter is a symbolic day to celebrate that message. 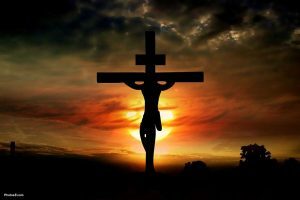 Easter is a Christian festival and holiday celebrating the resurrection of Jesus Christ on the third day after his crucifixion at Calvary as described in the New Testament. Easter is the culmination of the Passion of Christ, preceded by Lent, a forty-day period of fasting, prayer, and penance. The last week of Lent is called Holy Week, and it contains the days of the Easter Triduum, including Maundy Thursday (also known as Holy Thursday), commemorating the Last Supper and its preceding foot washing, as well as Good Friday, commemorating the crucifixion and death of Jesus. Easter is followed by a fifty-day period called Eastertide or the Easter Season, ending with Pentecost Sunday. Jesus is one of my mentors, along with Prophet Muhammad and a few others. Honoring them gives me the greatest sense of peace and gratitude. One thing the Muslims do well at burial sites is to pray for peace and blessings for the soul of the deceased. As a Muslim I believe he lives on continually transmitting his message of love. A few years ago, I was in Jerusalem, and was blessed to sit by the place where he was supposedly buried at the Church of Holy Sepulcher. I expressed my gratitude to God and Jesus for bringing the blessed message of love and forgiveness to humanity to create a better society for all of us to live. On my way to Al-Aqsa Mosque early in the morning, after the Ramadan morning meal (suhoor) at Imam Bukhari’s great great grandson’s house, who lives on Via Dolorosa, we walked. 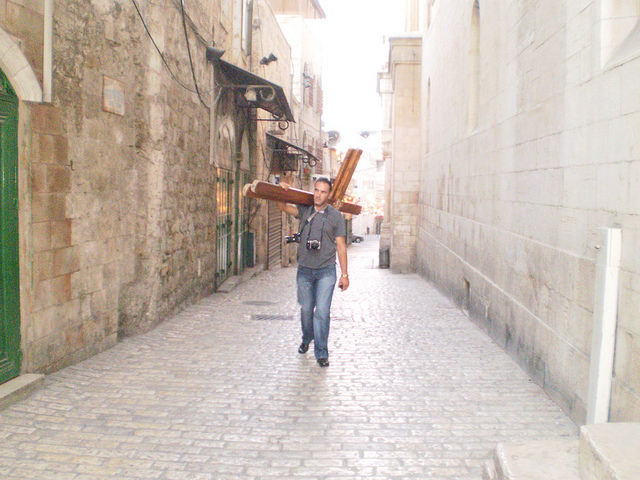 I saw a man carry a big cross on his shoulder; it was the same path Jesus had walked some 2,000 years ago. I could not resist stopping and feeling the awesome feeling with goosebumps all over me. I cherish that moment! As a Muslim and a pluralist, I want to make a point here: Jesus and his message belongs to the whole humanity, just as the message of all the spiritual masters including Buddha, Muhammad, Krishna, Zoroaster, Nanak and others, who are a blessing to humanity. If we can learn to appreciate the contribution of each one of the great men and women, who committed to make the world a better place, we become the blessed peacemakers. The choice is ours to believe in propaganda about others, and hold on to anxieties, or find the truth and be free. For our own salvation and freedom, we need to remove the false perceptions about others. Finding the truth is our own responsibility. Many a Christians don white cloth symbolizing purification. Indeed, Muslims do the same when they go to Mecca for the Hajj pilgrimage. 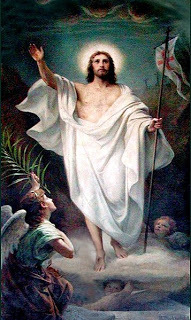 Jesus donned one piece of white cloth when he was baptized, and to this day the tradition is followed at the Yardenit. 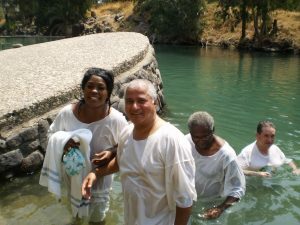 I was dunked at the same baptismal spot in River Jordan, a symbolic gesture of transformation and following Jesus. Thank God, the Baptist Minister agreed to customize the invocation for me. He recited, “in the name of God, and to honor Jesus, I baptize you today at this holy site.” Indeed, two Dutch imams felt comfortable with the recitation and followed the suit. One of them was a convert from Judaism, and the other from Christianity. 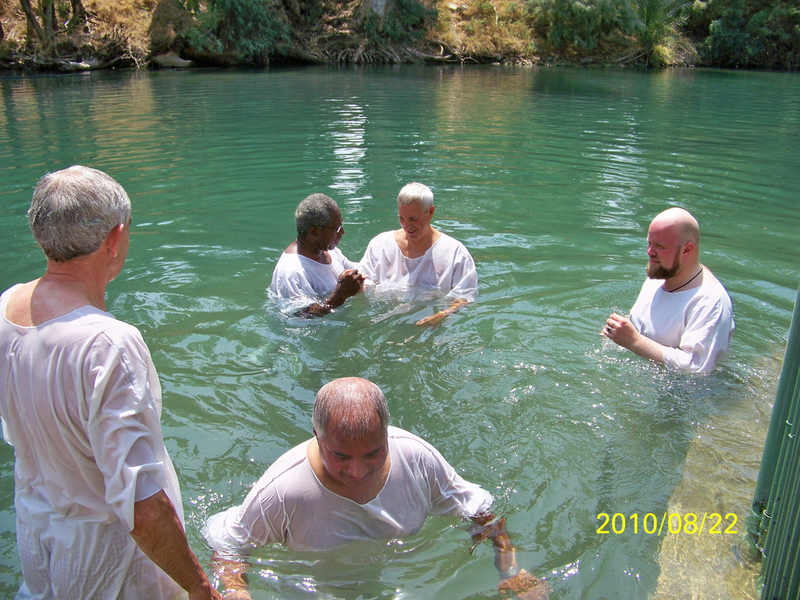 Perhaps I may be the first Muslim to be baptized. It was an enriching experience to me in particular, feeling the symbolic transformation of the feeling of love towards all of God’s creation. Muslims feel the same upon performance of Hajj Pilgrimage; we become child-like with love for all of God’s creation; life and matter. The Hindus cherish an identical feeling when they take a dip at the Sangam in River Ganges, particularly during the Kumbh Mela. As a token of solidarity, I joined my Christian friends and gave up drinking soda to honor their practice. I made that announcement on Sean Hannity’s show (he is a Catholic) on Fox News. I have made the effort to follow it as diligently as I could. Years ago, my daughter observed Lent, and I am glad she did: She got out of the addiction of Dr. Pepper, what a good thing it was! People give up smoking and this period of 40 days is renewal in every sense, whether you are Christian or not, you can join in the process of reflection and purifying and being in tune with fellow beings. Lent reminds me of the 30 days of Islam’s Ramadan, seven days of Paryushan of Jains, eight days of Jewish Passover and nine days of Hindu Navaratri. The essence of all these events is renewal of the soul and reflection on life. I am happy that these actions are designed to make better humans out of us. Some of you may not be aware that Jesus is revered by Muslims, belief in him as a prophet is a requisition. There is a full chapter on Mary in the Quran and Prophet Muhammad said there are three women who need to be looked up to as role models: Mary, Asia (the one who raised Moses) and Fatima (prophet’s daughter) and none of the women were traditional, they stood up against odds and changed the course of history. The Hijab many Muslim women wear has origins in Mother Mary’s Hijab. Jesus is my mentor, a true pluralist who had no barriers between him and humanity, as a Muslim I reiterate the affirmation of that thought; of being boundless. I salute Pope Francis for all the right things he has done so far, and he has many more things to accomplish in his life time, including mitigating conflicts between Jews and Christians, Christians and Muslims and Christians and others. I am willing to jump for him for the sake of creating peace for every human being.